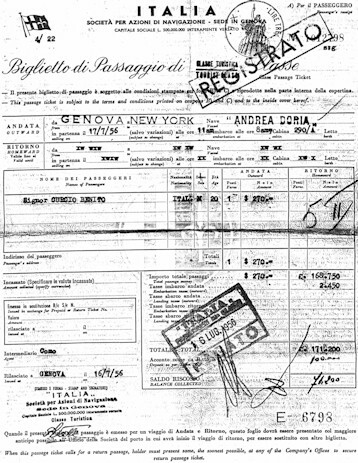 It was July 17, 1956 when Signor Benito Curcio arrived at the Genoa pier where the Andrea Doria was waiting for her 51st crossing to New York. The boarding doors opened at 8 a.m. and for the next three hours Benito and other passengers would board the ship and begin to settle into their cabins for their nine day crossing. Ballet dancer Nora Kovach and her husband Istvan Rabovsky boarded the ship and found they had been assigned Cabin 56. The assigned cabin was $60.00 more than they cared to pay and they were moved to Cabin 77. Their frugality saved their lives. Alessandro Forza, Giuseppe Mocchi and Salvatore Molino were officers on a Liberian tanker, Esmeralda and they were returning to the tanker docked in New Jersey after their vacation in Italy. 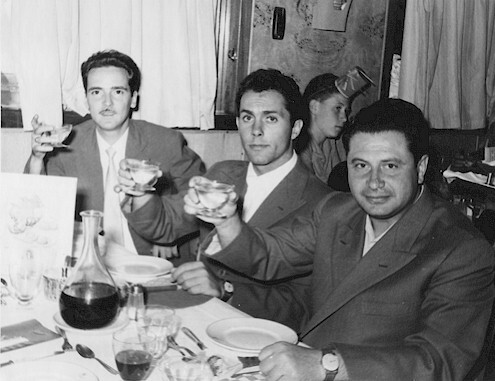 Alfred Barboni took an airplane to Italy to visit his dying mother. The flight made him so nervous that he decided it would be safer to travel by ship and he boarded the Andrea Doria. Departure was scheduled for 11 a.m. and shortly before the departure time, the ship's loudspeakers informed visitors it was time to go ashore. At 11 a.m. the announcement is made, "La nave e in partenza!" (The ship is departing). After the spumante-soaked buon voyage parties, it was time to go to the Belvedere Deck of the Andrea Doria. Whistle steam billowed against the red-white-green bands on her funnel, the blasts echoing against the hills of her home port of Genoa, as she slips her moorings. First stop in the commuter rounds of the Mediterranean Sea is Cannes on the French Rivera only a few hours from Genoa. Mr. and Mrs. Thure Peterson from New Jersey boarded the ship and were assigned to Cabin 56, the cabin Nora Kovack and Istvan Robovsky refused to take. Miss Julianne Mclean, a concert pianist, was making her third trip on the Andrea Doria, she was returning from Brussels where she participated in the Queen Elizabeth Concours. Tired and homesick she was happy to be aboard an "old friend". The next day, July 18, is the Italian port of Naples. 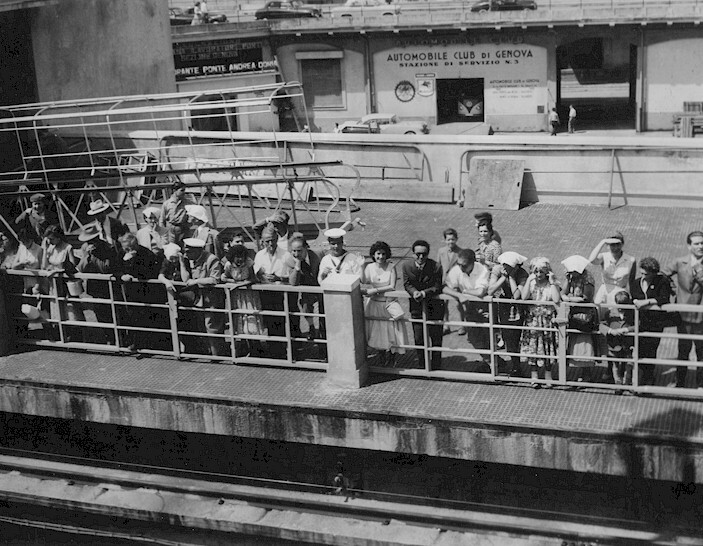 In Naples a large groups of Italian immigrants came on board. Antonio De Rubeis, his ticket in hand, stood on the pier and said goodbye to his wife and five children. A round of hugs for all led to tears, the hope of finding work and a better life in a new country. 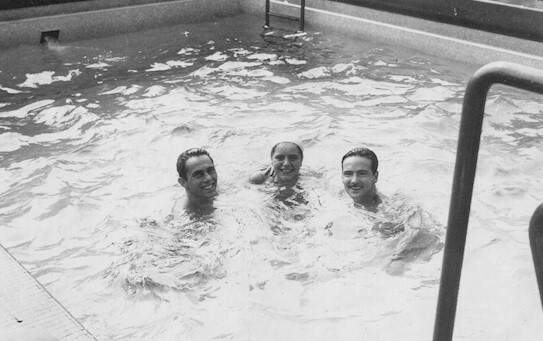 Santino Porporino boarded with his pregnant wife, Antonietta, and their two young children, Giuseppe and Bruna. They made there way to C Deck and settled into two separate cabins. Angela Moscatiello boarded with her two son's Luigi and Michael, they were on their way to Troy NY to live with cousins. Her three older children would follow at a later date. Michele and Maria Russo and their two small children Giovanna and Vincenza were on their way to Venezuela to live. They came from a town called Ruvo del Monte. They day before they left for the trip, they visited their aunt Filomena. Maria went in desperation, she told her aunt. "Aunt Filomena, I don't know why but I feel in my heart a terrible thing, really terrible, I don't want to leave." Her aunt attempted to calm her down and told her that if she didn't like Venezuela Michele had promised they would return back to Italy. The following morning they left their house and while boarding the taxi, 8 year old Vincenza turned around, screamed and cried and started climbing back up the many steps to her home. Michele went up after her and brought her back. Traveling along with the family was Michelina Suozzi, a neighbor from the same town. Michelina was going to Philadelphia to join the rest of her family. She was a quiet and afraid of making the trip by herself and she waited until the Russo family was going so she would be in the company of friendly people she knew. Maria and Vincenza's premonition of trouble was correct, the family would never reach New York. After leaving Naples, the Andrea Doria arrived at Gibraltar on July 20. The Andrea Doria did not dock at Gibraltar, but anchored offshore, forcing the passengers to take a launch out to the ship. 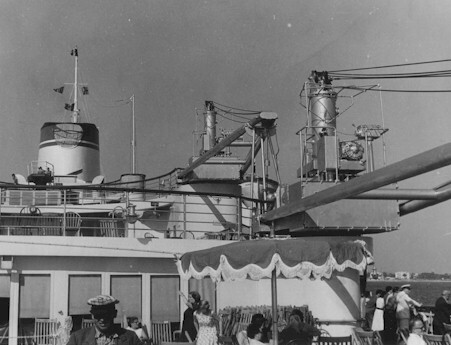 As they approached the liner Francis Thieriot, a Phi Beta Kappa scholar who thrived on detail, looked up at the ship. "See that doorway?" he asked his son Peter. "That leads to the foyer where we'll board." Francis pointed out the portholes to the right of the Foyer door. The first porthole was the Purser's Office and the next was his and his wife's cabin. Peter's cabin was the second porthole to the left of the Foyer doors. 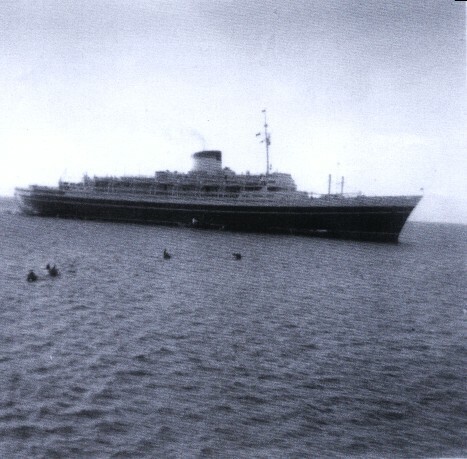 By 12:30 p.m. the Andrea Doria weighed anchor and left the entrance of the Mediterranean Sea heading west into the North Atlantic ocean. Captain Calamai noted in his own logbook : A total of 1,134 passengers (190 First Class, 267 Cabin Class, 677 Tourist Class), 401 tons of freight, 9 autos, 522 pieces of baggage and 1,754 bags of mail. One of the automobiles in the garage was a $100,000.00 car called the "Norseman". Hand built by Ghia in Italy for Chrysler, the car was two years in the making. This was an "idea" car, one of the first aerodynamic cars built in aluminum to reduce weight. 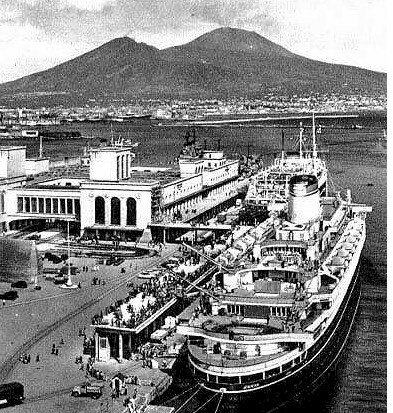 This trip was to be the last commanded by Captain Calamai, upon the Andrea Doria's return to Genoa, he was to take a scheduled vacation and then transfer to the Cristoforo Colombo as the Italian Line's senior master. For Calamai it was the apex of 40 years at sea which had included being Staff Captain of Conte Grande, Augustus and Conte di Savoia and Captain of Saturnia, Ugolino, Paolo Toscanelli and Santa Cruz. For the 572 man crew, each day had its routine of work and rest. The crew consisted of the ship's officers and sailors who were responsible for the operation of the ship and the support staff (waiters, chambermaids, cooks, musicians, busboys etc..) that saw to the comfort of the passengers. Each man and woman in the crew had his or her job to do and knew his or her specific role in the chain of command on the ship. The Lido life beckons: a Campari in the bar, perhaps a poolside luncheon of melone con prosciutto and foccacia; shipboard aromas of pesto, garlic, espresso, linoleum polish and sun warmed teak decks; the umbrellas and the sunburn of the lido, the magnificent public rooms; the Italian poste flag at the fore. Astern lies a wide, white wake as the Andrea Doria, engine telegraphs at "tutta forza" (full speed) and wheelhouse doors open to the breezes of the warm afternoon, steams to a rendezvous with destiny. The voyage had been routine, nothing marking it in any way different from any of the previous fifty trips to New York. For the 1,134 passengers, the sea voyage had been a time to unwind, to settle into the luxury of being served and entertained. It was a time to cast off one's everyday cares and worries, to marvel at the vastness and power of the sea and to sense one's own individual place in the world. The routine of shipboard living, adjusting one's walk and digestion to the rhythm and roll of the ship, had become a way of life after a day or two at sea. Each day was marked by certain regular events. There were religious services each morning in the ship's chapel, the daily movie, the sports events on the open deck, swimming in one of the three pools, cocktails, after-dinner games, drinking, dancing and ,above all, the enormous and elaborate meals. Mrs. Laura Bremermann was berthed in A Deck Cabin 228 with three other Italian women, and on July 24th she sent a wireless message to her husband Floyd that she was arriving in New York on the 26th so he could pick her up when the ship docked. There was packing to be done, and there were custom declarations to be filled out and good-byes to be said to shipboard acquaintances. They were scheduled to dock in New York at 9 a.m. Thursday, July 26. Typically for the season, the passage was enjoyed in fine weather. And just as typically, the last full day out (Wednesday, July 25th) as the liner coursed toward Nantucket and her rendezvous with New York the next morning, the midday sun grew hazy and the air humid. As the the haze turned into fog the eerie feeling made everyone rather subdued. It was a quiet and uneventful day, the passengers packed their bags and placed them outside their cabins. They would be picked up and placed on the starboard deck for off loading in New York.